Off Topic / Re: Phicen: Discussion, advice, and STAN LEE!! OMG I was just looking at that Stan Lee doll! He's pretty amazing. It would be so fun to take pictures with him! Customs / Re: Tips for painting "factory" lipstick on a partial custom. Since you're going over pink, I would just paint right over top, that way you have a guideline. Fluid acrylics are your best bet as far as paint. Sales / Re: MOVING SALE! All must go by June 2! Still LOTS of stuff left, all of it needs to go! Bump - added DotD Ghoulia and a couple of nudes; updated everything! Free black MH stands for anyone who buys a doll. ILF dolls are still on shelves here (except Cleo), but retail price is the $40+ that you are complaining about. Sales / Re: MOVING SALE! All must go by May 30! Probably around $14 for a padded envelope? Prices to the UK aren't that much more than the US. Cleo's looking good, and I think her eyebrows look quite even. No real person has a perfectly symmetrical face anyway! Customs / Re: Sugru or Instamorph? I was looking into sugru for the same purpose, and it looks like it doesn't take detail very well - all the examples I could find of people using it was stuff that's completely devoid of any detail. It does stay flexible after it's dry though I think, so I do wonder if you could use it in press molds..
Customs / Re: Why not Zoidberg? That is hilarious! Great job, she's pretty fantastic, and not a character I would ever have thought to see at MH. Ooh shiny Robecca! I really like the color palette you used for her faceup, it works really well with the metallic body color. Introductions! / Re: hello from the pnw! other than that, i live with my boyfriend and my ridiculous cat pawly the polydactyl, and we do a lot of gaming. currently we're pretty active with world of warcraft, yay mythic brf ~__~!! i also play league of legends and civ 5, and also a lot of other single player games. Ooh, she's pretty! The gold lips are different. Customs / Re: My first ever MH face/eye re-paint! Seconding the suggestion for another layer of white in her eyes, but that is seriously great for a first repaint! That Clawd is amazing! I love the way you painted the tip of his nose, it makes him look subtley wolfier, if that makes sense. Thanks for posting that link xxnickiyxx! This is something I don't know anything about. I actually really like the experimental blend too; totally agree with lululilacdoll. It makes her really look more like Neighthan too, with the bold streaks. It's nice to see thrift store dolls getting some love and new life. It always hurts my heart to see them looking all forlorn after they've been played with by kids. Very pretty! The glitter almost hides the visible plastic innards, which is really nice. Is the glitter shedding at all? This stuff needs to go, someone take it off my hands! Makies are really cool and they are going in some great directions. I actually have one but mine is a couple of years old now, and they've updated SO MUCH since then. 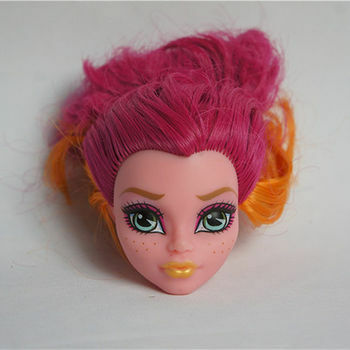 People may complain about the price, but where else can you design your own doll's face sculpt, not to mention have it in your hands in a matter of weeks? The joints are fantastic too, btw - mine has the old type which don't look as nice, but they hold a pose better than any doll I've ever handled.